At 7:05 pm President Paul Wood opened the meeting and led members in the Pledge of Allegiance. fourteen members and eight guests, who had come for the crime prevention presentation, were present. Minutes from the April meeting were approved with no objection. Treasurer Beulah Sutherland reported no income or disbursements since the last meeting. Park Partnership – Paul reported on the successful clean-up of the park at 12th and Michigan. Volunteers cleared trash and weeds from the park, cleaned up the bus stop, and transplanted the witch hazel near the bus stop. Paul also reported that he will be sending in the application to the Casey Trees RiverSmart program for those who have requested shade trees to be planted for free on their private property. a. Impact from the three hospital shifts that would rotate through the parking garage every 24 hours. b. Impact of construction traffic on the neighborhood during the building of the parking garage. c. Combined impact of Turkey Thicket Recreation Center, the new Brookland School, and shuttle buses at the Metro station. e. The impact of 24-hour lights on residents should also be considered. Joan Thiel’s motion that the Association support Paul’s letter was approved unanimously. The need for a traffic study of the intersection at Michigan Avenue, Taylor Street and 13 Street was also discussed. This intersection is difficult for both motorists and pedestrians alike. Paul noted that this intersection is encompassed by the Edgewood-Brookland Livability Study. 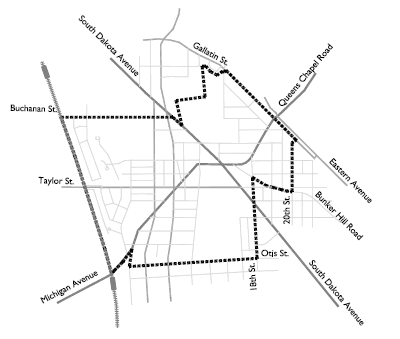 This study extend eastward from Edgewood along Michigan Avenue and includes the streets South of Taylor Street to this intersection and then Eastward to Taylor Street. However, the livability study appears focused on East-West traffic. Paul will ask that DDOT address the significant amount of North-South traffic along 12th and 13th Streets which also greatly impact the neighborhood. The meeting was adjourned at 08:30.